Q. How can I repair my credit score? A. Credit is primarily measured by a FICO score that runs from 300 to 850 points. The higher the score, the better your credit. First, get your free report from annualcreditreport.com and check for errors. Next, arrange new payment terms with credit card companies and ask them to report the new terms to credit bureaus as “paying as agreed” vs. “not paying as agreed.” Then, pay off loans with companies and banks that still exist, as loans associated with businesses that no longer exist or have merged/been bought out are harder for credit bureaus to verify. If a loan can’t be verified, the bureau has to remove it so start with those that can be easily verified. Also try to lower your debt utilization rate (your debt divided by available credit). Finally, talk to a credit union as they are more willing to work with those with less than stellar credit. This entry was posted in Ask Betsy on April 18, 2019 by Katie Belton. 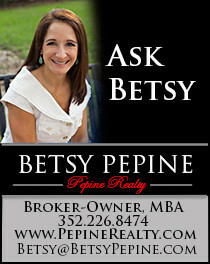 Q. I put an offer on a house and after several rounds of negotiating; the seller and I came to terms. I signed the offer right away and my agent sent it to the seller to sign. The seller was travelling and said he would sign it the next day. Well that is today and his agent just called and said another offer came in this morning and he accepted that one instead. What recourse do I have? A. Unfortunately, this is not an uncommon occurrence. The recent use of electronic signatures have help decrease this because they allow people to sign via their computer or phone and thus people can sign quickly. Verbal contracts are not enforceable and while one could reasonably argue that it’s unethical, it’s likely not worth your time pursuing. Next time, insist the seller sign within 24 hours and utilize an electronic signature program if need be. Also, have your Realtor tell the selling agent, if another offer comes in before yours is signed, to let you know and give you the opportunity to change your offer. This is common courtesy but does not always happen unless you specifically request it. This entry was posted in Ask Betsy on April 12, 2019 by Katie Belton. Q. I close on the sale of my house next week. Will I get reimbursed for property taxes I have paid already this year? A. We pay our taxes in arrears. You pay the property taxes owed from Jan 1st to the closing date. The title company will make the calculation for you and it will be on your closing statement. Your estimated taxes for the year can be found on the Property Appraiser’s website, however, the final millage rates will not be set until October so they could change slightly. If the proposed taxes and your actual taxes differ significantly, you can request the title company to recalculate the amounts post closing. If you are escrowing your taxes, your lender will send you a refund for the taxes you have double paid after the loan has closed. This entry was posted in Ask Betsy on April 5, 2019 by Katie Belton.